Because CFC-11 still accounts for one-quarter of all chlorine present in today’s stratosphere, expectations for the ozone hole to heal by mid-century depend on an accelerating decline of CFC-11 in the atmosphere as its emissions diminish-- which should happen with no new CFC-11 production. Precise measurements of global atmospheric concentrations of CFC-11 made by NOAA and CIRES scientists at 12 remote sites around the globe show that CFC-11 concentrations declined at an accelerating rate prior to 2002 as expected. Then, surprisingly, the rate of decline hardly changed over the decade that followed. Even more unexpected was that the rate of decline slowed by 50 percent after 2012. After considering a number of possible causes, Montzka and his colleagues concluded that CFC emissions must have increased after 2012. This conclusion was confirmed by other changes recorded in NOAA’s measurements during the same period, such as a widening difference between CFC-11 concentrations in the northern and southern hemispheres - evidence that the new source was somewhere north of the equator. The findings of Montzka and his team of researchers from CIRES, the UK, and the Netherlands, represent the first time emissions of one of the three most abundant, long-lived CFCs have increased for a sustained period since production controls took effect in the late 1980s. Scientists had been predicting that by the mid- to late century, the abundance of ozone-depleting gases would fall to levels last seen before the Antarctic ozone hole began to appear in the early 1980s. Montzka said the new analysis can't definitively explain why emissions of CFC-11 are increasing, but in the paper, the team discusses potential reasons why. "In the end we concluded that it’s most likely that someone may be producing the CFC-11 that’s escaping to the atmosphere," he said. "We don't know why they might be doing that and if it is being made for some specific purpose, or inadvertently as a side product of some other chemical process." 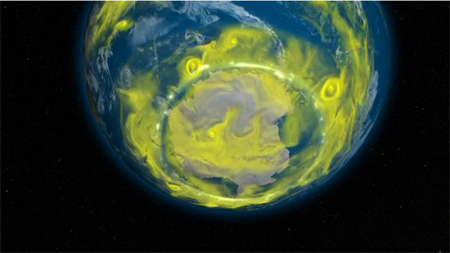 If the source of these new emissions can be identified and controlled soon, the damage to the ozone layer should be minor, Montzka said If not remedied soon, however, substantial delays in ozone layer recovery could be expected, he said. David Fahey, director of NOAA's Chemical Science Division and co-chair of the United Nations Environment Programme’s Ozone Secretariat ‘s Science Advisory Panel, said ongoing monitoring of the atmosphere will be key to ensuring that the goal of restoring the ozone layer is achieved.